Even though I cook a lot of vegan meals, I do not have a lot of experience with vegan baking. However, I recently found out that I have an intolerance to dairy and eggs (see: elimination diet) and I am now on a mission to re-create some of my favourite baked goods without any animal products. Previously, I had success with vegan “blondies” recipes (Strawberry Chocolate Blondies and Pumpkin Pecan White Chocolate Blondies), but felt that I still lacked the know-how to veganize a lot of my favourite baked goods. So, I bought a few cookbooks to help me transition to a mainly vegan diet and to learn more about baking without animal products. One book I really enjoyed is called 100 Best Vegan Baking Recipes by Kris Holechek. In fact, this banana bread recipe is adapated from Kris’ recipe. The book has a 100 swoon-worthy recipes, but the banana bread immediately caught my eye. Other titles I have enjoyed are: The Joy of Vegan Baking by Colleen Patrick-Goudreau, Chloe’s Vegan Desserts by Chloe Coscarelli and all of the baking books by Isa Chandra Moskowitz and Terry Hope Romero. The key message in all of the books is that you don’t need eggs and diary to make incredibly delicious baked goods. One you’ve got the basics of baking down, you can easily see how plant-based options such as flax/chia eggs, the right amount of baking powder and soda, tofu, fruit butters and nut milks can yield the same results as eggs and dairy. This banana bread proves this fact on all levels. It’s moist and dense, but with a nice light crumb. Exactly as banana bread should be. The bread baked up perfectly with a beautiful golden crust and was very easy to put together with minimal ingredients. Feel free to omit the walnuts if walnuts don’t float your boat. 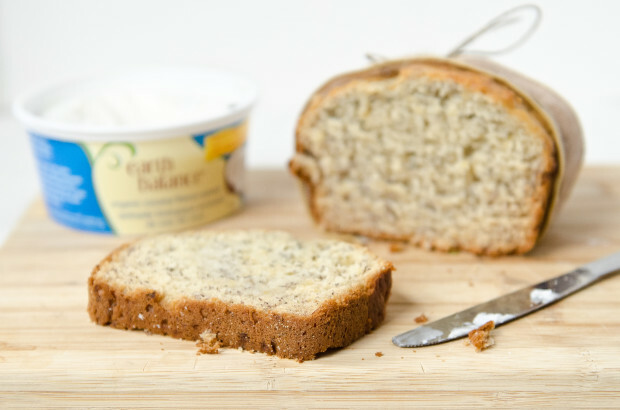 Slather the banana bread with some Earth Balance Coconut Spread and you’ll be in heaven. Preheat the oven to 350'F degrees. Lightly grease a 9 x 5-inch loaf pan with canola oil or vegan butter. In a large bowl, combine the oil and brown sugar. Add mashed bananas, vanilla extract and almond milk. Stir to combine. Add the dry ingredients to the wet ingredients. Mix until just combined. Spread the batter into the prepared loaf pan and bake for 45 minutes, or until the top is golden and a toothpick in the middle comes out clean. You will also know the bread is done when it is pulling away from the sides of the pan. Allow the bread to cool in the pan for 30 minutes. Run knife around the edges to loosen and turn bread out of the pan onto a cooling rack. Store leftover bread covered at room temperature. Serve plain or with Earth Balance Coconut Spread. Note: I have no affiliation with Earth Balance. I just really enjoy their Coconut Spread. Looks looks amazing! I changed it up a little, adding some spices (cinnamon, nutmeg, allspice) and mini vegan chocolate chips. But other than that, this recipe looks perfect! Two loaves baking now, and I’m sure they’ll turn out fantastic — they already are making my kitchen smell wonderful! Great add-in suggestions! :) I definitely want to add in some chocolate chips next time. Banana and chocolate are a perfect pair. Hope you enjoyed the banana bread!